Preheat oven to 400 degrees. In a small bowl, combine chili powder, smoked paprika, cumin, salt and pepper. Place sweet potato chunks on a baking sheet. Drizzle with oil and sprinkle with spice mixture. Mix until sweet potatoes are evenly coated with oil and spices. Bake for 15-20 minutes, until potatoes are fork-tender and crispy on the outside. To make salad, place lettuce in a large bowl or on a platter. 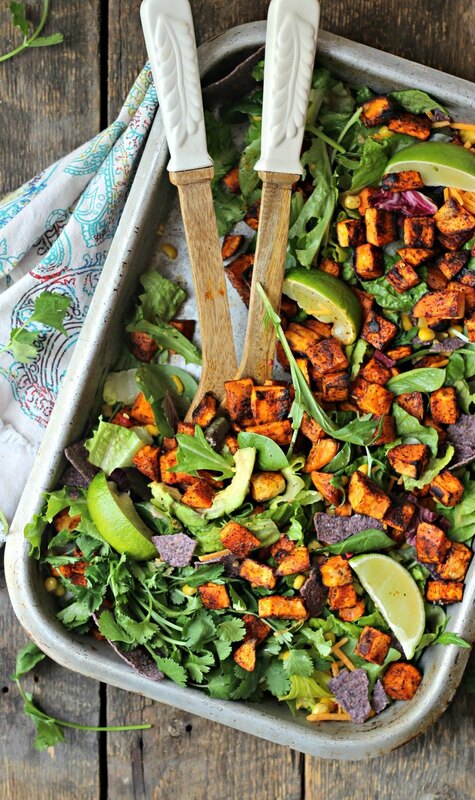 Top with sweet potatoes, corn, avocado, tomatoes, cilantro, cheese and tortilla chips. Drizzle salad with fresh lime juice, salsa ranch and/or cilantro-avocado dressing.